When we think of revolutionary developments in music technology, the ones that spring to mind are those that do previously unheard–of things to sound. Witness, for instance, the excitement that was generated by Celemony’s Melodyne DNA, which seemed almost to defy the laws of physics in its ability to perform polyphonic pitch correction. For my money, though, one of the most impressive technological achievements of recent years is one that has no audible aspects whatsoever. Any form of musical notation inevitably represents a drastic simplification of a musical performance. No matter how many expression markings you add to a score, it still leaves a great deal to the interpretative skills of the player. Over the years, notation packages such as Sibelius and Finale have got better at mimicking the interpretation that might be applied by human performers, so as to make score playback more realistic. They’ve been less successful, however, in tackling the reverse challenge. Most notation packages, and of course all DAWs that support notation, will let you play or record a MIDI performance, and represent the notes you play on one or more staves. What they won’t do, as a rule, is analyse this MIDI data to sift the wheat of the actual score from the chaff of the player’s interpretation. In other words, if you incorporate expressive devices such as rubato into your playing, the chances are you’ll end up with an unreadable score full of odd note lengths. And if you can’t figure out what time signature your piece is in, and where the bar lines should fall, you’re unlikely to get much help from your software. Distilling a readable and correct score from an expressive human performance is a formidable challenge for any computer algorithm — and it’s one that Swedish developers DoReMIR largely solved in their ScoreCleaner software, reviewed in SOS July 2012 (www.soundonsound.com/sos/jul12/articles/score-cleaner.htm). As Robin Bigwood found in his review, ScoreCleaner really could take freely played MIDI input and spit out a score that would, in the vast majority of cases, be very nearly spot–on, correctly identifying pickup bars, odd time signatures, polyphonic voices and so on. If there was a down side to ScoreCleaner, it was that this core technological breakthrough was embodied in a software package that was somewhat limited in other respects. If you wanted to create publishable score documents, extract parts, or even add devices such as guitar chord symbols and repeats, you’d need to export its results into a conventional notation package to do so. Many of these omissions are addressed in DoReMIR’s new ScoreCloud, which, though it incorporates much of ScoreCleaner, is marketed as a new product rather than as an update of that program. The new name reflects a change of business model on the company’s part. Whereas ScoreCleaner was a conventional, paid–for program that worked with local files on your hard drive, ScoreCloud is based on a subscription model; and unless you opt for the forthcoming Platinum version, it offers only cloud storage, with no option to save your songs locally. DoReMIR aren’t the first software company to make this shift, but it must be said that their pricing seems extremely generous. The ScoreCloud Studio software is a free download, and you can also get a free ScoreCloud Silver account which will allow you to store up to 50 songs without ever getting your credit card out. If you need more storage, $4 a month gets you a Gold account which will give you an unlimited number of songs, and at $7 a month, even the Platinum version that supports offline files won’t break the bank. (Those who bought the original ScoreCleaner get automatically upgraded to ScoreCloud Platinum.) There’s also an iOS app called ScoreCloud Express, which uses DoReMIR’s new audio analysis engine to transcribe monophonic melody parts recorded via your iPhone’s mic input. This can be sync’ed to the full version of ScoreCould running on your computer, for overdubbing and further editing. Descriptions such as “user–friendly” and “immediate” are not ones that spring to mind with most notation software, but ScoreCloud’s user interface is disarmingly straightforward. It consists of a main window displaying whatever score you’re working with, surrounded by three smaller panels. The panel running down the left–hand side is a browser, which displays the contents of your ScoreCloud online storage. That to the right is context–sensitive: when you select an element of your score, the upper part displays a graphical menu of possible actions that can be applied to it, while the lower shows help material related to that element. Perhaps the most important of the ancillary panes, though, is the one running along the bottom. The Listener captures raw MIDI data and groups it into Snippets, which are then analysed to turn them into scores. This is called the Listener, and its job is to capture MIDI and audio input. Assuming you have some sort of MIDI device attached to your computer, there’s no need to set anything up or hit a Record button: you simply start playing (with ScoreCloud generating a basic piano tone), and notes appear in the Listener. Press the space bar or leave a long enough silence, and ScoreCloud will treat the notes you’ve played as a self–contained unit called a Snippet. 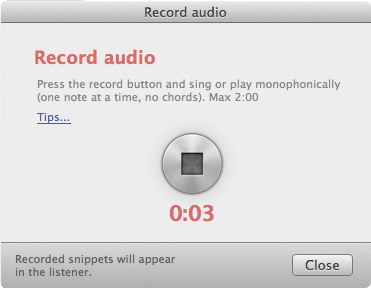 In theory, all you need to do to turn a Snippet into a score is hit the Analyze button. What’s more, theory and real life actually coincide in ScoreCloud, and most of the time, what appears in the main score window will be a recognisable and intelligently notated version of your performance. There’s really no need to employ the forced, mechanical strict–tempo playing you’d need to get acceptable results from other notation packages; nor, for the most part, do you need to tell ScoreCloud anything about the piece before you start. And if you do need to correct something, you can almost always do so simply by right–clicking on it and choosing from the resulting contextual menu. For instance, I sometimes found that the algorithm was reluctant to employ compound time signatures, so it would choose to represent what I thought of as 6/8 as 2/4 with lots of triplets. Changing this is as simple as right–clicking on the time signature. Likewise, on the rare occasions where ScoreCloud failed to correctly identify a pick–up note, shifting the entire score left or right to re–bar it is trivially easy. Back when we reviewed ScoreCleaner, its editing facilities sufficed to tidy up what was generated by the transcription algorithm, but lacked many of the features you’d expect to see in even a moderately capable conventional notation package. 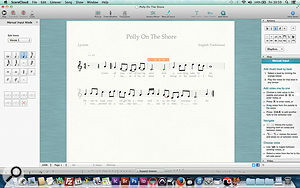 Many of those holes have now been addressed, and the version of ScoreCloud I tested had full support for transposing instruments, repeats (with variant endings if required), system breaks, slurs, hairpins and other dynamic markings, fermata, mordents and trills, and even basic bowing marks for string parts. You can even notate quarter tones and double sharps/flats. There’s no fine control over the graphical position of these additions, but in most cases I found that ScoreCloud did a good job of placing them appropriately. In most cases they’re easy to find and use, too, though there are a few features (such as inserting empty measures into a score) that for some reason can’t be achieved by right–clicking, requiring instead a visit to the ‘Add More’ menu. When it comes to tidying up, there are some well–thought–out editing features that serve to make most operations relatively painless. For instance, if you position the mouse pointer near, but not on, a note, and left–click, a red box will appear highlighting all the notes that make up that beat. You can then click on the drop–down Rhythm menu in the Actions pane to choose from various alternate rhythmic phrases that might suit that selection of notes. In general, I found that I was always able to correct the actual content of the score, but it’s not always possible to clear up the occasional graphical conflicts that arise where lyrics, chords, and interpretation marks fight for space above and below the staves. Nor can you make major changes to the way a score looks. As well as real–time MIDI input, ScoreCloud offers new ways of entering score data. A Manual Input mode brings up a palette of notes and rests where the browser usually lives, and lets you step through the score adding them either from the QWERTY keyboard, a MIDI input device or by dragging and dropping. This is pretty streamlined and works well for the most part, though using it for any length of time certainly brings home just what a boon the real–time transcription algorithm is. As well as real–time MIDI input, ScoreCloud can also derive scores from monophonic audio parts (above) or the kind of manual, step–based data entry familiar from conventional notation packages (below). The Actions and Help panes to the right reflect the possible changes that can be made to whatever’s selected (in this case the crotchet that is shown in red). ScoreCloud can also accept an audio input, and given a suitably clear monophonic signal, will notate it as a melodic line in a score. I tried it on a variety of sources — singing, electric guitar and synthesizer — and it was extremely effective. On the Mac version, it was also perfectly reliable, whereas on Windows 7, I often got an error message telling me my recording was empty; this may be because although it supports ASIO, ScoreCloud doesn’t give you the option of selecting an audio input if you have a multi–input soundcard. And oddly, ScoreCloud’s audio transcription only works with audio recorded directly into the program; there’s no way to open an existing audio file, though this is planned for a forthcoming update. Also new in ScoreCloud is a drum staff New in ScoreCloud is a basic drum notation facility., which is nice to see, but pretty basic in its current implementation. If you use real–time entry to try to record or overdub a drum part, you don’t hear drums but piano; and manual entry can lead to awkward conflicts between the drum staff and the rest of the score. For example, if you try adding a drum staff to a score that is swung, its quavers default to being straight, and there’s no obvious way to get them to conform to the overall triplet feel. And talking of swing, despite the ease with which ScoreCloud can flip between representing a swung score in triplets or standard quavers, it’s not currently possible to add a note to the tempo indication at the start of the score to explain to the performer that something should be played with a swung feel. This, along with numerous other minor improvements, is on DoReMIR’s radar and may well be fixed by the time you read this. In terms of the types of scores it can represent, and the detail with which they can be edited, ScoreCloud still doesn’t really compare with a dedicated package such as Sibelius. But that’s absolutely not the point. 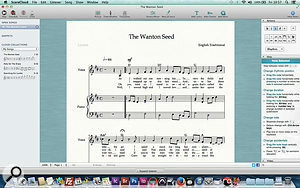 ScoreCloud is not supposed to be the last word in sheet music publishing, allowing you manually to position every dot and line with meticulous accuracy; nor is it intended to provide complete control over massive scores and all their subsidiary parts, or to convincingly play back a symphony using high–quality sampled instruments. If you need those features, you need a conventional notation program — and since ScoreCloud supports MusicXML export, there’s nothing to stop you starting work here and then migrating your projects to Sibelius or Finale later. 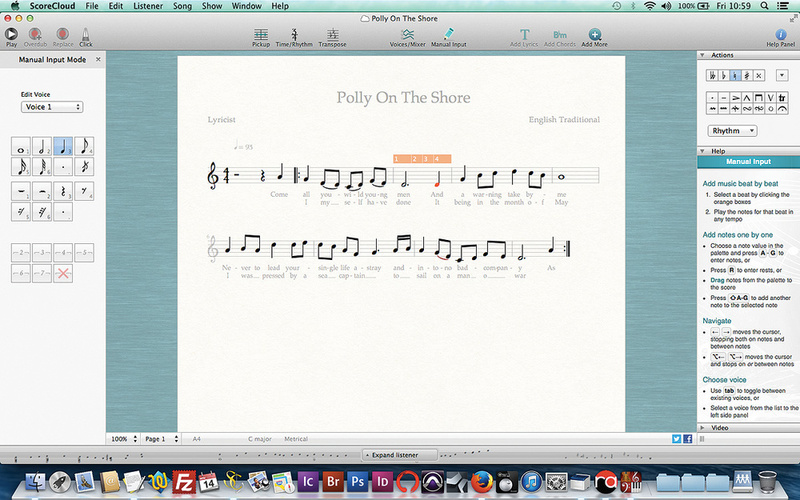 What ScoreCloud excels at is the basic process of transcribing a musical performance. If you need to create musical notation and you work from the keyboard — or indeed any other MIDI instrument — there’s simply nothing to rival the speed and accuracy with which ScoreCloud will turn your playing into a readable score. Since we reviewed its earlier incarnation three years ago, DoReMIR have done a great deal of work to make it more versatile, and I also found it much more stable than ScoreCleaner. Whether you work in education, composition or any other branch of music where notation is needed, I think ScoreCloud will save you time and effort. And since it’s free, there’s absolutely nothing to stop you downloading it and trying it out! There are several well–established notation packages for Mac OS and Windows, including Avid’s Sibelius, MakeMusic’s Finale and PreSonus’s Notion, but ScoreCloud is probably best seen as a complement to these rather than as a rival for them. When it comes to generating readable scores from freely played keyboard parts, nothing can touch it. 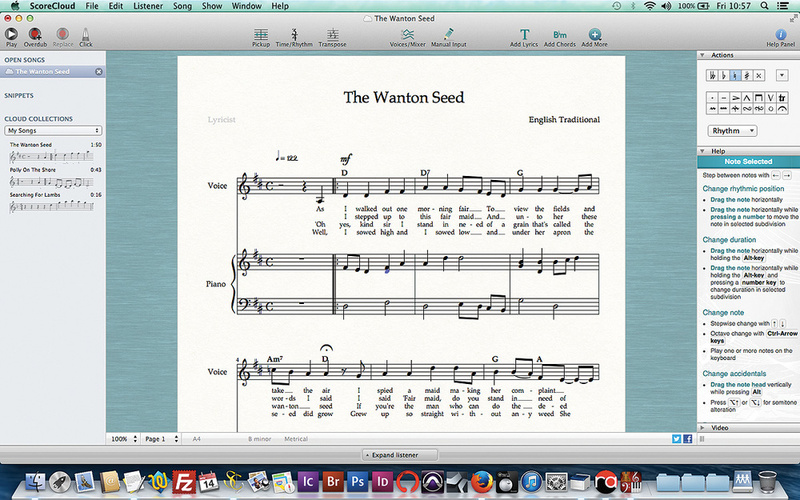 Editing features and notation options much improved over the original ScoreCleaner. Manual note entry and audio part analysis both work well. Wholly cloud–based unless you get the Platinum version, so requires an Internet connection. For advanced notation tasks, or creating scores of publishable quality, you’ll need a conventional notation package too. If you work with notation, ScoreCloud will almost certainly make your life easier. And it’s free! Silver version free; Gold version $4 per month; Platinum version $7 per month.